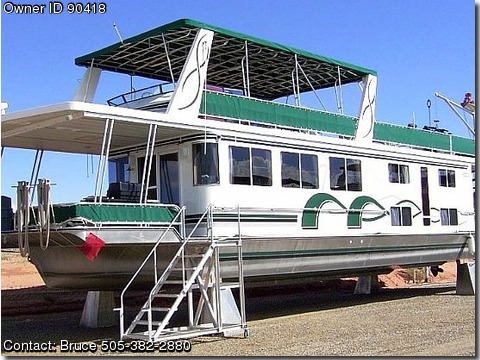 Enjoy two continuous weeks (or any portion thereof) of Lake Powell’s grandeur during the last half of September every year on this luxury houseboat commissioned in 2003. The Misty Morning is a shared-ownership houseboat with a total of 16 owners. Shared ownership is distinct from time-share arrangements, which are prohibited by the National Park Service; only owners can trade time slots amongst themselves, and an owner must be on the boat at all times the boat is on the lake. This choice 2-week block of time is the only such block available on Misty Morning; all others are single weeks during prime season (Jun - Sep) with optional, additional cost weeks available during the off season. Mid- to late-September is the absolute optimum time to be on Lake Powell, as we’ve learned from 25 years of houseboating experience there. The summer vacation crowds are gone, fishing is great, the water is warm enough for all-day swimming, and the nights are cool for comfortable sleeping without air conditioning. Misty Morning is managed by a full-time, professional management service that maintains the boat in peak condition. This is facilitated by the fact that the boat is launched and retrieved for each outing, and all cleaning and necessary repairs are accomplished in the management company's private boat yard. You can spend the first night of your vacation on the boat in the boat yard, avoiding hotel costs, and load all of your belongings and supplies directly from your vehicle into the boat, avoiding crowds on the launch ramp and courtesy docks at Wahweep Marina. All linens, towels, soaps, and paper products are provided, and the management company can stock ice and purchase and deliver groceries for nominal fees. You can park your vehicles in the boat yard and ride the company’s shuttle to the lake. The company will even launch your power boat or jetski for you if you choose to bring your own rather than rent from one of the vendors in Page, AZ. Misty Morning features 4 berths with queen beds, 2 full marine heads with showers, an all-electric galley with 22 cu. ft. refrigerator, ceramic top range and oven, microwave, trash compactor, and hot water heater. Pots, pans, dishes, and utensils are all provided. Additionally, mattresses are provided on the upper deck to sleep an additional 4 – 6 people, and the main cabin has a queen-size sofa sleeper. The boat offers satellite TV with DVD player, XM radio, and separate stereo systems in the main cabin and upper deck. There’s an electric boat davit for lifting and securing personal water craft on the upper deck when moving on the lake. There’s a water slide off the stern and a large freezer and Weber gas grill on the forward deck. The boat is powered by twin 250HP Mercury Marine 5.0 liter V8 engines with outdrives and can cruise at 14+ knots to get you up and down the 130 miles of Lake Powell. There’s a 2.5KV generator providing power to the house batteries, which work through an inverter to supply AC power to the entire boat. Finally, the boat can be piloted from the helm in the main cabin or the flybridge on the upper deck. Clearly, Misty Morning is a luxury houseboat that you can purchase now and enjoy trouble-free houseboating year after year on the nation’s most beautiful lake for the cost of renting a comparable boat just one time.